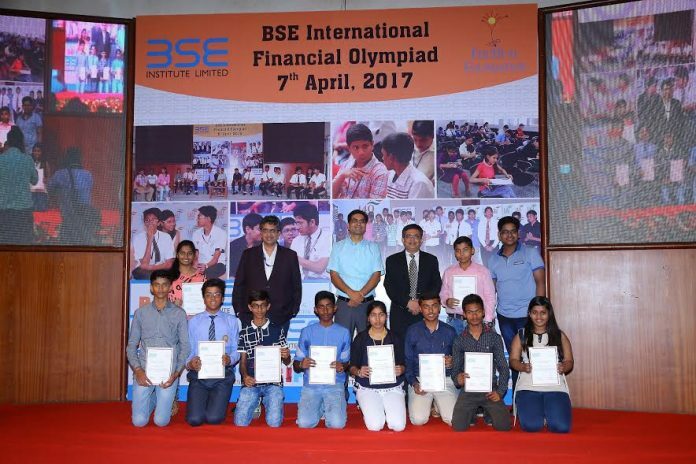 Mumbai: BSE Institute Ltd, a wholly owned subsidiary of the BSE Ltd hosted the finale of BSE International Financial Olympiad at the BSE International convention hall in Mumbai on Monday. Over 108 students competed with each other to win the national level competition. A total of 15,000 students from over 600 schools across the country participated in the national level competition which was spread over 6 months. BSE International Financial Olympiad is an initiative to extend financial literacy to the school level through its flagship innovative and educative national level financial quiz competition. The first round of BSE International Financial Olympiad covered over 600 schools across 202 cities in 24 Indian states and 108 students were selected for the finale in Mumbai. BSE International Financial Olympiad is aimed at encouraging school students to explore and learn more about financial world by developing analytical and problem solving skills that will be essential to their careers. The purpose of BSE International Financial Olympiad is to create awareness about financial literacy amongst students at a young age. It is aimed at empowering students with a proper understanding of the opportunities in the financial markets. Financial Olympiad helps students prioritize their personal financial goals and guides them towards becoming financially responsible. During the initial rounds of BSE International Financial Olympiad, students studying in class 9, 10, 11 and 12 participated in inter school written tests. The winners received cash scholarships for higher studies.